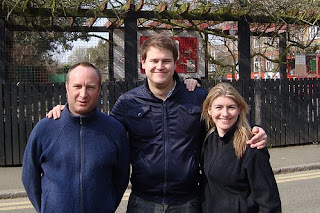 Back in October, Stockwell Labour Party voted for three local activists to be their candidates for the council elections next Thursday - Alex Bigham, Pete Bowyer and Imogen Walker (pictured). All three live in Stockwell, and have a strong knowledge and experience of the area. By comparison, the Lib Dems have selected three candidates who don't even live in Stockwell ward! One even lives as far away as Streatham Hill, hardly local to the area. People locally are telling us that they want community champions who live in their local area, know what is happening locally and can be trusted to stand up for Stockwell residents. Kate Appleby, a Tradescant Road resident said, "Labour has done loads for young people in Stockwell - from investing in schools like Stockwell Park High and youth centres like the Lansdowne youth club and the Oasis Centre. This investment would never have happened under the Lib Dems and Tories." Kieran Crotty, a Stockwell resident and housing campaigner told us, "Only Labour is serious about improving housing in Lambeth. They lobbied government to get the rent increase reduced by £100 and will spend money to upgrade 10,000 homes if they get re-elected. Things haven't been perfect, but Labour is sorting out the mess they inherited from the Lib Dems." Pete Bowyer has represented Stockwell residents since 2003, when the Lib Dem councillor was forced to resign after being found guilty of stealing public money. Since then, Pete helped establish a drinking ban around the tube station and secured a grant for the Dorset Road Community Centre. Imogen Walker has been your Stockwell Labour councillor since 2006, and lives just off Lansdowne Way. She has helped secure funding for a half million pound community centre for Portuguese residents and secured extra funding for youth services at the Oasis centre. Alex Bigham has lived in Stockwell for over 7 years, and his family for nearly 3 decades. He would like to see the Stockwell war memorial cleaned up and restored to its former glory, and is campaigning for a new bus route to run through Stockwell. On Thursday 6th May Stockwell residents will have the chance to have their say - local candidates from Labour who they can trust with their services, or Lib Dems from outside the area who would put everything at risk.